The world's only Chip Measurement System (CMS) makes spot measurements as easy as 1, 2, 3: insert chip - start measurement - read measurement result on the LCD display. The Drager CMS combines the advantages of the Drager-Tubes with those of an optoelectronic analysis system. Two components define the system: the analyser and the substance-specific chip. The Drager CMS is ready for use after only a brief instruction. It makes no difference which gas or vapour you wish to measure - the instrument is used in the same way every time. The operation is guided by a menu on the display and a single button/switch. The display can be backlit and is available in German, English, French or Spanish. After an automatic system self-test, the analyser is powered up and the measurement system is immediately ready for operation. Simply insert the chip, perform the measurement and read the measurement result displayed as a concentration on the screen. At the end of the measurement, the chip is automatically ejected from the instrument, and the analyser shuts down. An audible signal sounds after each operating step. 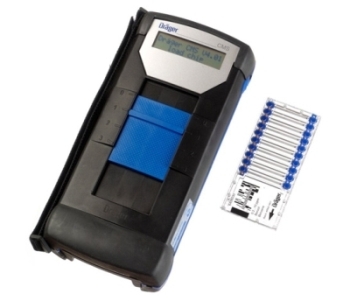 Power is supplied by four standard and easily replaceable batteries which are especially suited to the analyser's requirements (see technical data). The battery capacity allows for more than seven hours of measurement and is, of course, always displayed on the screen. The principle of mass current measurement ensures that the instrument remains unaffected by fluctuations in air pressure. Because the chips are calibrated before leaving the factory, there is no need for the user to calibrate the Drager CMS. Any possible temperature and humidity effects are checked during factory calibration. The analyser is explosion protected and certified in accordance with Cenelec (Europe), UL (USA) and UL/CSA (Canada). In addition, the system is protected against dust and splash water in accordance with IP 54, and is resistant to electromagnetic waves. To allow measurements at places which are difficult to access, a remote system is available. This comprises of an additional pump and extension hose, and is connected to the back of the analyser. Because the remote system is activated by its own switch, the system can remain attached to the analyser. A telescopic probe can also be attached to the Remote-System.